Conor Chaplin in Pompey's squad against Stevenage. 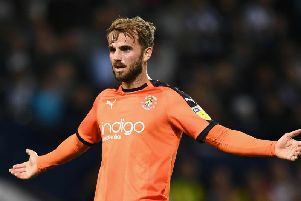 The striker has been the subject of persistent interest from Coventry, with Bristol Rovers and Barnsley also chasing his signature. Yet he is among nine players named on the bench for this afternoon’s Lamex Stadium clash. With Ben Close (hamstring) and Dion Donohue (foot) missing, Adam May is handed a midfield start ahead of Danny Rose to feature alongside Tom Naylor. Joining Rose among the substitutes is Christian Burgess, replaced at centre-half by Jack Whatmough. Pompey: MacGillivray, Thompson, Whatmough, Clarke, Brown, May, Naylor, Evans, Lowe, Curtis, Pitman. Subs: McGee, Rose, Burgess, Dennis, Hawkins, Chaplin, Smith, Casey, Haunstrup.